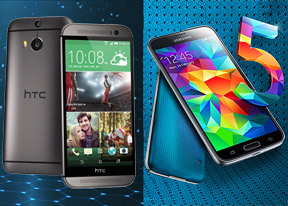 It terms of absolute loudness, the Samsung Galaxy S5 has a slight advantage over the HTC One (M8). This makes hearing the phone ringing a little easier, but that's only if you place it face down so that the loudspeaker at the back is facing open air. The front-facing speakers of the One (M8) can't get muffled when you put the phone face down. As we've already mentioned, the speakers also make listening to music and watching videos without headphones a far more pleasurable experience. That's because they sound better than the single speaker on the Galaxy S5 and quality is more important for music than absolute loudness. Winner: HTC One (M8). HTC puts great emphasis on the speakers and it comes as no surprise they perform great. The Galaxy S5 isn't that much louder than the HTC and, due to speaker placement, its loudspeaker isn't better at notifying you for incoming calls and messages. 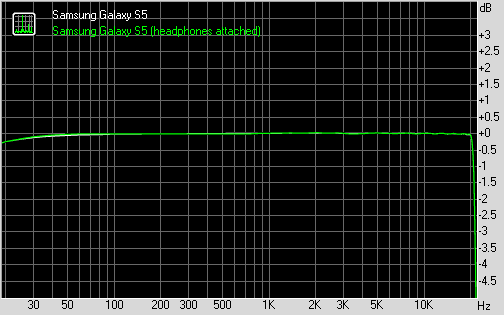 The Samsung Galaxy S5 and HTC One (M8) both showed splendidly clean audio output in our tests. 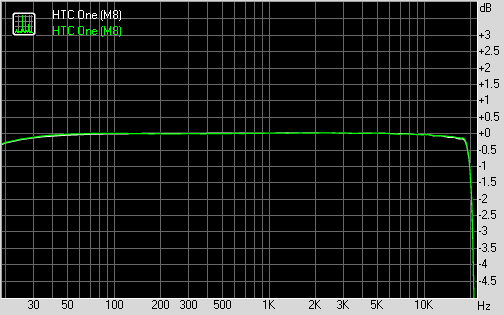 The two smartphones put in flawless performances when connected to an active external amplifier and very little degradation when we plugged in a pair of headphones. The only notable difference in terms of purity is the slightly better quality of the stereo that the HTC One (M8) produces with headphones. However, a somewhat easier to spot advantage of the HTC smartphone is the loudness of its output, which blows all other handsets we've tested out of the water. Winner: HTC One (M8). With quality audio hardware, the HTC flagship manages excellent headphone output too. The clarity might be only a tad better on the One (M8), but combined with the far louder output it's enough to make it the definitive winner here.